Those of us who are living with (and have been for many years) Lyme Disease know first hand how devastating and debilitating it is. It is also very misunderstood. 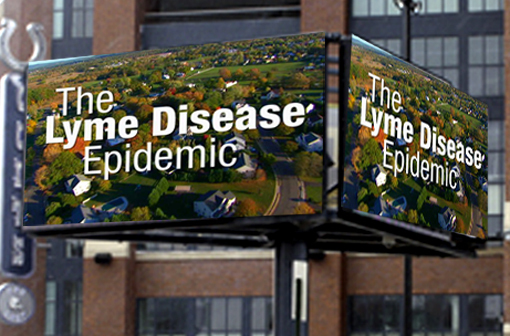 So I was elated to see that ILADS, the International Lyme and Associated Diseases Society, will be running a public service campaign next Sunday at the Super Bowl on a Jumbotron outside Lucas Oil Stadium to bring greater and much needed awareness to the misdiagnosis of Lyme Disease. According to Dr. Leo J. Shea III, Ph.D., President of the non-profit ILADS, "Lyme Disease is a silent epidemic in America. We want to alert and educate consumers about this disease, which is often misdiagnosed. Left untreated, it will become chronic and debilitating. Tick-borne illnesses compromise your immune system and the diagnosis, which is largely based on symptoms, can be illusive unless a physician is Lyme-literate." Another fantastic thing that ILADS is doing is the LymeWall. Check it out; these are the true faces of Lyme Disease. And sadly, some of these precious faces belong to children. If you're reading this and didn't know that children can get Lyme Disease too, I will tell you that it can and has been passed transplacentally during pregnancy to babies. I have a friend whose youngest child contracted Lyme from her during her pregnancy. She didn't know she had it at the time. He's been a sick little fella. If that isn't a stout eye-opener; I don't know what is. It is my desire to help bring the much due and needed awareness to this disease. I was misdiagnosed for years with MS (Multiple Sclerosis), Transverse Myelitis (likely true secondary to Lyme and/or viruses), Post-viral Demyelinating Syndrome (also likely true), CFIDS (Chronic Fatigue Immune Dysfunction Syndrome; which is perhaps secondary) and Chronic Mono (which is true but isn't the root; its secondary) among a few others. We found out in 2010 that I really have Chronic Lyme Disease; the true root of this illness of 18 years. I've written before that I have wondered many times what my life would be like had we found this out sooner. But, after much contemplation and prayer, I know it is a futile pursuit that I must, and do, yield to my faith in Christ. I still have hope for healing for all of us. I still have hope for a better future. I plan on writing more this year to bring greater awareness and understanding to Chronic Lyme Disease and it's co-infections and how profoundly it affects ones life. It's time. So what about it my Lyme friends? Should we add our pics to the mix on the LymeWall? Maybe some of you already have. I'm contemplating it. Nevertheless, I think it's great that ILADS, Open Eye Pictures and Burgess Communications are stepping up to the plate like they are. Kudos to them! And kudos to us who keep fighting this Lyme fight daily with integrity, perseverance and guts!